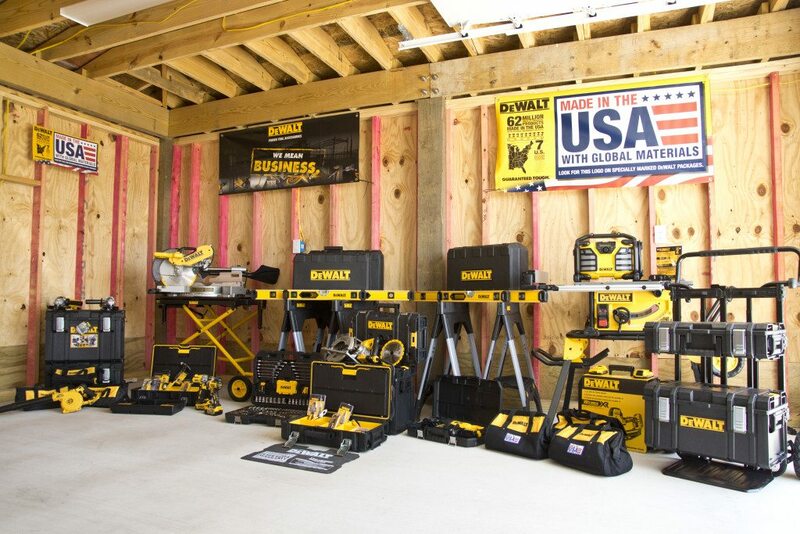 Beaumont, Texas March 30, 2016: Wounded service members and their family members, who participate in future Lone Survivor Foundation (LSF) healing retreats on the Bolivar Peninsula, Texas facility will have access to a fully equipped, wood working shop donated by DEWALT Tools. Members of DEWALT and Coastal Welding Supply of Beaumont, Texas met recently with LSF Executive Director Terry Jung of Houston, TX and the retreat’s builder and facility manager Brian Byrom, of the Bolivar Peninsula firm, Brint Construction, to determine the needs of service members attending the four day retreats held throughout the year. DEWALT and Coastal Welding Supply, business partners and long- time supporters of veteran programs, thought a work shop would be an ideal opportunity to give back to our service men and women, along with their family members, who have given so much for each of us. 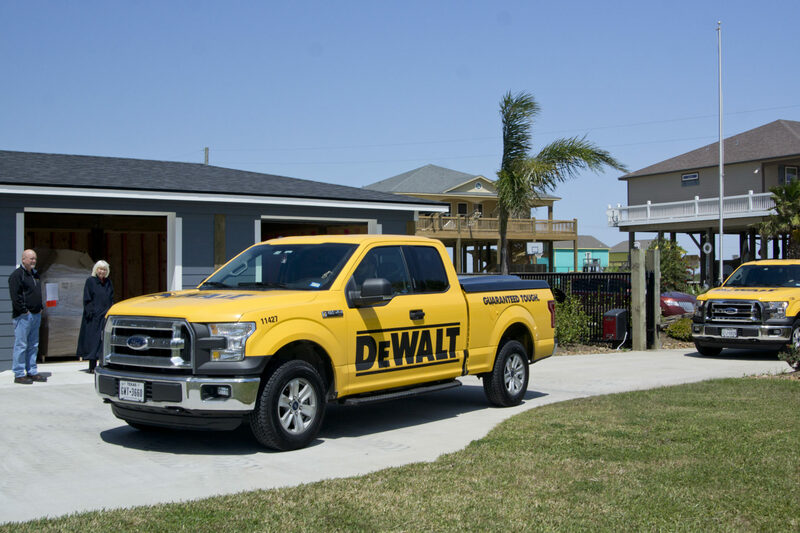 On March 24, three DEWALT trucks, loaded with power tools, work benches, tool chests and other donated equipment were delivered to the retreat facility and installed by members of the Lone Survivor Foundation, Brint Construction, Coastal Welding Supply and DEWALT. Tools for Healing. Plans are for future retreat attendees to build, and leave behind completed projects for future attendees to enjoy, as part of their support for one another’s healing. Dewalt Tool Delivery. Dale Ederlin, Lone Survivor Foundation Controller and Database Manager, along with Coastal Welding Supply Director of Marketing Cindy Yohe Lindsay , watch as trucks filled with donated Dewalt tools arrive at the Lone Survivor Foundation retreat facility on the Bolivar Peninsula, Texas. The Delivery Team (from left to right) Lone Survivor Foundation Program Director Ann Brown, Dewalt Representatives; Field Marketing Coordinator, Tom Diekemper, Account Manager Chris Feifel and Sales Coordinator Josh Tucker, Coastal Welding Supply’s Director of Marketing Cindy Yohe Lindsay, President J.C. “Chuck” Mazoch, Corporate Secretary Barbara Mazoch Nelson and Vice President Tom Johnson, Lone Survivor Foundation Marketing Director Jen Brown and Brian Byrom, of Brint Construction, lead facilitator of the retreat’s creation and construction. A Workshop in Progress. Members of the team prepare to set up a wood working shop for retreat attendees. Family retreats will also benefit from service members and their children creating projects together. A Gift of Healing. Dewalt donated three truckloads of tools to the Bolivar Peninsula, Texas retreat facility to the Lone Survivor Foundation retreat facility. (from left to right) Sales Coordinator, Josh Tucker, Field Marketing Coordinator, Tom Diekemper and Account Manager Chris Feifel. Veteran Support. Coastal Welding Supply is proud to be lifetime supporters of our military. Founder Al Mazoch served with both the Merchant Marines and the US Army. (from left to right) Vice President Tom Johnson, US Army Vietnam veteran, Director of Marketing Cindy Yohe Lindsay, former US Marine Corps Sergeant, Corporate Secretary Barbara Mazoch Nelson and President J.C. “Chuck” Mazoch. The Unpacking Begins. Brian Byrom begins the unpacking of Dewalt tools for the retreat’s woodworking shop. A Rewarding Partnership. Dewalt and Coastal Welding Supply worked together to bring the Lone Survivor Foundation retreat facility on Bolivar Peninsula, Texas a state of the art wood working shop. (from left to right) Dewalt Representatives; Field Marketing Coordinator, Tom Diekemper, Sales Coordinator, Josh Tucker and Account Manager Chris Feifel. Coastal Welding President J.C. “Chuck” Mazoch, Corporate Secretary Barbara Mazoch Nelson, Vice President Tom Johnson and Director of Marketing Cindy Yohe Lindsay. Building Dreams. The group works to assemble a workshop for future retreat attendees.